This article describes the Moksha menu system used by Bodhi Linux. Left-click for the Main Menu (or press the Menu Key, or click the Start Gadget on the shelf). Right-click for the Favorites Menu (or press Alt+Menu key) – this will only show if you have set it up with your favorite applications. Middle-click (scroll-wheel click) for the Windows Menu (or press Ctrl+Menu key) – this lists all open and minimized windows, allowing you to switch between them. You can also use Alt+Tab to switch between windows. By moving the mouse over the Main Menu items you get to sub-menus, and mousing over these may lead to further sub-menus (sub-menus may sometimes “disappear” off the right of the screen; if this happens simply move the mouse pointer to the right edge of the screen and the menus will shift to the left). To set up your Favorites Menu, click to Main menu > Settings > Settings Panel > Apps > Favorite Applications. The Favorite Applications dialog box opens (press Shift+F10 to maximize it vertically) – here you can Add applications to your menu and, at the Order tab, put them in order. If you wish to remove a “Favorites” item from the Main Menu (decluttering, perhaps? ), go to Main menu > Settings > Settings Panel > Menus > Menu Settings. You can also turn off the “Generic” item at the Menu Settings dialog box , so that the generic descriptors of applications no longer appear in the menus. 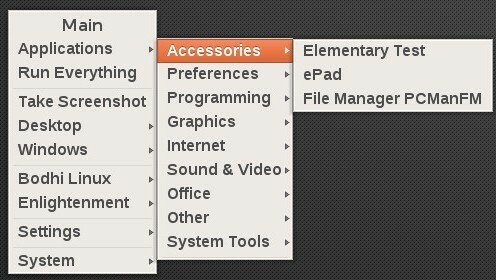 To speed up menuing on a slower computer, go to the Miscellaneous tab of the Menu Settings dialog box and tick Disable Icons in Menus. Applications: leads to the various GUI applications installed on your system, categorized as Accessories, Internet, Office applications, and so on. Places: displays, in menu form, the directories (folders) and sub-directories on your system, opening them in PCManFM. Quick Launcher: launches the Quick Launcher application, which provides a quick way to run the various applications and dialog boxes on your system. You can also launch Quick Launcher by pressing Alt+Esc or Ctrl+Alt+Space, thereby bypassing the menu system completely. More information can be found here. Take Screen Shot: this takes a screen shot – multiple monitors if you have them – and opens them with ePhoto, Bodhi’s default image viewer (you can easily upload the photos to a public imgure.com to embed into the Forums, etc – directions are at the bottom of this page). About Operating System: hovering over this menu will provide you with help, several sets of about information (Bodhi, Moksha and Theme) and allow you to restart Moksha. Settings: accesses the multitude of dialog boxes that allow you to tweak Moksha to your heart’s content! It also leads to the Settings Panel, which provides an alternative route to these dialog boxes. System: leads to the Power Down, Suspend, and other system functions. Favorites: displays your Favorites menu. You can if you wish remove this item from your menu (see above). Navigate: displays, in menu form, the directories (folders) and subdirectories on your system, opening them in the Enlightenment File Manager (EFM). You can remove this item from your menu by unloading the EFM Starter module. Run Everything: launches the Run Everything application, which provides a quick way to run the various applications and dialog boxes on your system. You can also launch Run Everything by pressing Alt+Esc or Ctrl+Alt+Space, thereby bypassing the menu system completely. Take Screenshot: allows you to take and save a shot of your whole screen. To take a shot of an open window, right-click the title bar and choose the Screenshot option from that. You can remove this menu item by unloading the Shot module. Desktop: leads to various desktop options, including placing gadgets on the desktop, virtual desktops, configuring shelves, and hiding windows. Windows: accesses any open or minimized window, and allows you to clean up windows. Bodhi Linux: Bodhi’s extension to the menu system, leading to the Quick Start Guide and other Bodhi-specific information. Enlightenment: allows you to restart Enlightenment if an error occurs, accesses some information about Enlightenment and your current theme, and allows you to exit Enlightenment itself. Settings: accesses the multitude of dialog boxes that allow you to tweak Enlightenment to your heart’s content! It also leads to the Settings Panel, which provides an alternative route to these dialog boxes.